Riding the Waves of La Union Surfing Break 2017 | FEED, Inc.
7 November 2017, by Maria Rejina Balangat, Urbiztondo, San Juan, La Union. Known as one of the best destinations for surfing, La Union is a go-to tourist spot for surfers, students, adventure seekers and nature lovers. Proximity wise, “LU” or “Elyu” is the closest province to Metro Manila and promises to give the lifestyle and experience of Surfing to one and all. Every October, just in time with school’s semestral break, the local tourism group hyped up LU as a surfing and festival destination through a project themed “La Union Surfing Break”. This project aimed to uplift the tourism activity of LU, create opportunities for business ventures, build movements for social and environmental sustainability and open up grounds for developmental interests. Mondo Project together with Fostering Education & Environment for Development (FEED Inc.) took this opportunity to showcase their projects and cause to the LU crowd. 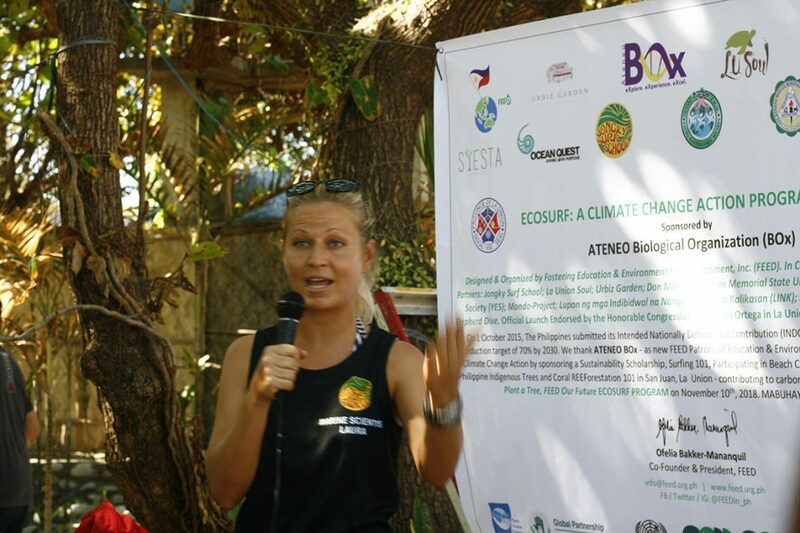 Last 28-29 October 2017, the team joined the eco-tourism activity called “Sustainably Stoked” held at Urbiz Garden, San Juan, La Union. Ms. Tina Antonio from Urbiz Garden, also co-founder of La Union Soul was very supportive of the group hence created this new and worthwhile activity. Aside from selling the shirts and seedlings, the group also took part in planting Mangroves. These plants were provided by FEED to boost the program for eco-tourism. Mr. Celso Jucutan, Co-founder at Lupon ng mga Indibidwal na Nangangalaga sa Kalikasan (LINK) and member of Young Earthsavers’ Society (DMMMSU NLUC) taught and led the team in the planting activity. “It was a good chance for us to show how Mondo Project is trying to help and contribute to the environment through our simple ways – like ours, we sell shirts and plants trees,” shared by Rej Balangat. The team has high hopes that more and more people will get to know the mission of Mondo Project and be able to support it by purchasing its merchandise. “I enjoyed the mangrove planting and of course the beach!” said Victoria Balangat who at her young age has been involved in a number of tree planting activities already and getting her interests into helping the environment. “We hope to join more activities like these and we hope to be back in LU again!” added by Bogs Balangat.